Praia do Rosa in Brazil’s southern state of Santa Catarina offers visitors the perfect combination of ecotourism and sophistication. The region was first discovered for tourism in the 70’s after a few serious surfers looking to find a scenic and affordable spot to set up shop found paradise here. In 2003, Praia do Rosa was recognized as one of the 30 most beautiful bays in the world. Along its 2 kms of soft sand you’ll find tan fans watching local pro surfers show off their tricks while gaggles of newbies looking to learn how to tame their own waves vacation here to fine tune their skills. 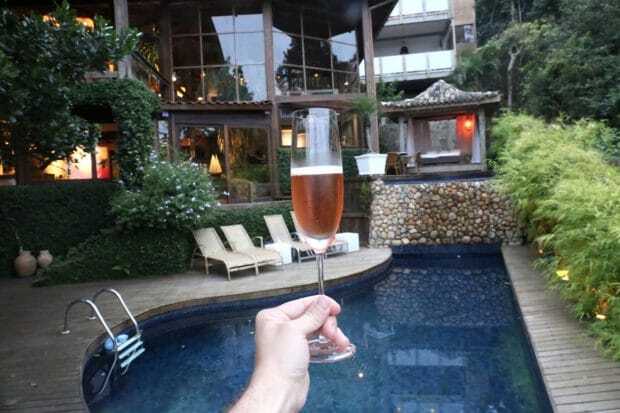 While the beach is a beauty, Praia do Rosa’s top notch boutique hotels, stellar restaurants, colourful fashion boutiques and nearby nature trails make it the perfect spot to recharge after partying hard in Rio. My friendly guides for the week were Lesley Cushing and Marta Dalla Chiesa who have been running Brazil Ecojourneys since 2003. Their bespoke tour company specializes in travel to South Brazil with a niche focus on ecotourism and LGBT travel. I was in town for their annual Gay Surf Camp which first launched in 2013. Over the last three years they’ve hosted newbie surfers from Canada, America, Argentina, UK, Germany and Brazil. If you’re looking to lap up that luxury after a long day spent whipping over waves book yourself into a posh pad at Quinta do Bucanero. Overlooking a rare saltwater lagoon, Quinta do Bucanero is an enchanting hideaway which has received a long list of accolades by the likes of the New York Times and National Geographic Traveller for its sustainable design and world class amenities. Romantic’s swoon for the Master Suite which features spacious balcony with panoramic views of the sea, lake, hills and surrounding lush vegetation. 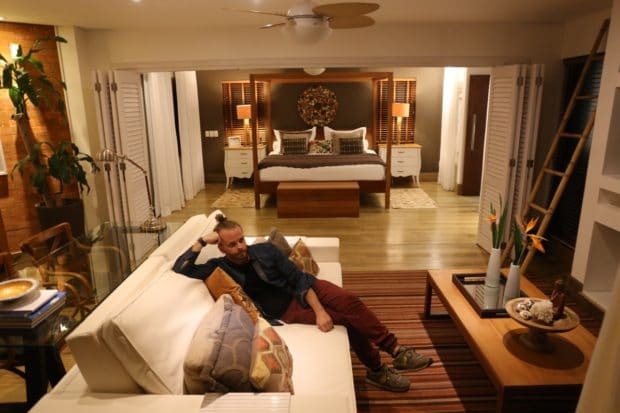 Each suite on the property plays home to unique handmade items and decorative pieces such as hardwood tables, sofa cushions, lampshades and hand embroidered sachets. Wander through the space and you’ll find Nespresso coffee machine, 8 bottle wine cellar, Natura Ekos bath amenities, stylish living room and plush Queen bed. A glamorous cabana lit by a glowing red lantern sits perched over the hotel’s petite pool, a perfect place to spend the day if you’re looking to take a break from the beach. 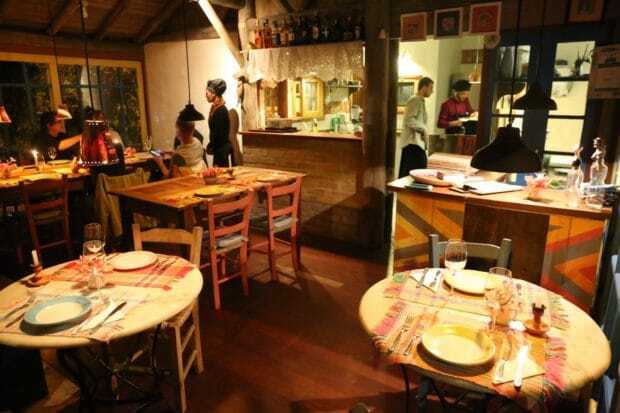 If you’re feeling peckish enjoy a fine feast at Balcony Bistro which caters to tan fans looking to lounge by the pool or those keen to tuck in for a white tablecloth adorned fancy feast. The views at sunset here are stunning, best enjoyed with a glass of locally produced sparkling rose! 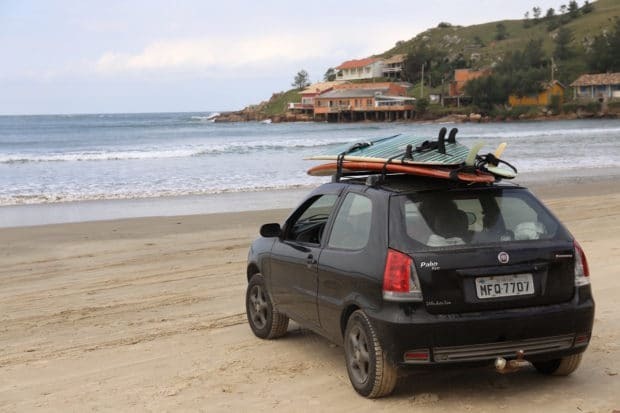 In 1995 Captain David opened the first surf school on Praia do Rosa. 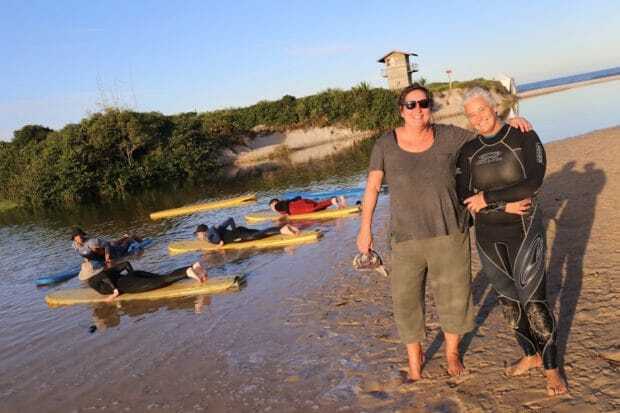 The Captain, as he is affectionately known by his more than 15,000 students is an expert at prepping beginners for gentle but enjoyable surf breaks and is respected by the town’s more advanced surfers. Beginners start their first day with a detailed lesson on land before skipping over to the lagoon for a stress-free board balancing lesson. 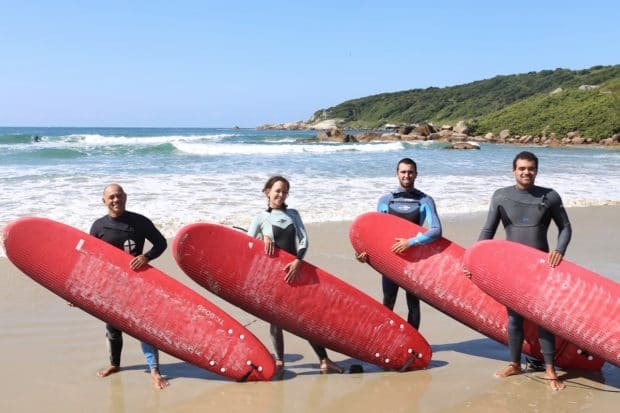 For more experienced surfers who don’t need the basics, surf camp offers the best waves in Brazil with a friendly local, as well as the expertise of the Captain to help improve your performance. Celebrate your early morning surfing success with a few ice cold craft beer’s on the beach. 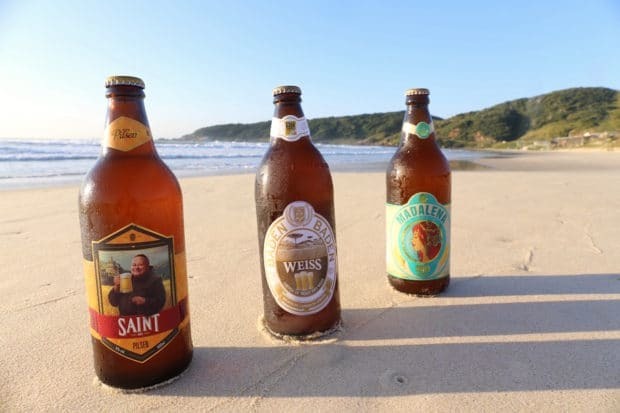 While watered down Brahma is Brazil’s most internationally recognized brew I was wildly impressed by the craft beer culture thriving across the country. Most grocery stores offer a wide selection of local offerings from hoppy IPA’s to citrus-forward Weiss. Crack open a bottle and quench your thirst while watching those rolling waves crash into shore. On our final day we enjoyed a road trip south to explore further down the coast. Our stop in Laguna was a memorable one as fishermen have become world famous here for working with a local bottlenose dolphin pod to catch fish. 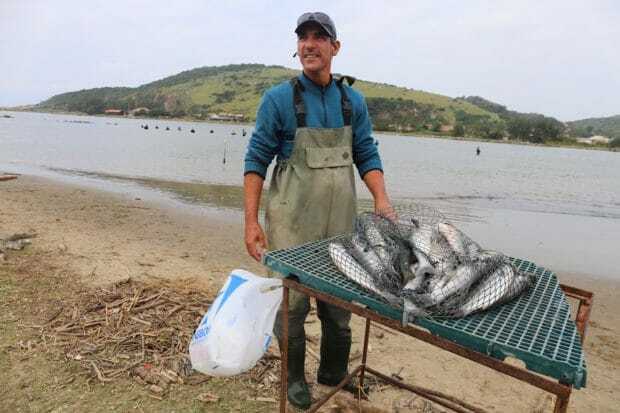 Walk onto the beach and you’ll find fisherman standing in the shallows up to their hips in a straight line waiting for the dolphins to approach. The pod drive fish towards the fishermen, then one dolphin rolls over, which the fishermen know is a sign to throw out their nets. Fishermen haul in their nets full of flopping mullet while the dolphins feed on those trying to escape. What’s most fascinating is that the dolphins were never trained for this behaviour; the all-natural collaboration has been going on since 1847! After finishing up in Laguna we hopped on a ferry which puttered across a picturesque bay. We spent our afternoon exploring remote surf beaches south of the city which Captain David likes to call “taking his class on a Surfari.” After zipping around a few beautiful beaches the Captain and his surf crew parked on a bay surrounded by cute little cottages that sat perched over the ocean. Moments later the surf crew were zipping up their wetsuits, grabbing their boards and zig-zagging over perfectly capped waves with not another surfer in sight. A perfect escape for those looking for a serene surf experience!